After a bit long time ,i'm back with an awesome trick to save to your and others data by directly providing you the apk file generator link for all Apps present in Google Play Store , using this link you can simply download any application's .apk file directly without searching a lot on internet between Popup Ads and all . Now a days, many of us prefer to have a backup of apps in our phones and many of us like to download apps apk file directly that help in saving data and also prevent use from hassle to download all apps if we change our phone. you can do MD5 file check if you have doubt about the latest version of that App. so, just follow two steps tutorial provided below with screenshot and download any Android Apps .apk file in few seconds. 1. 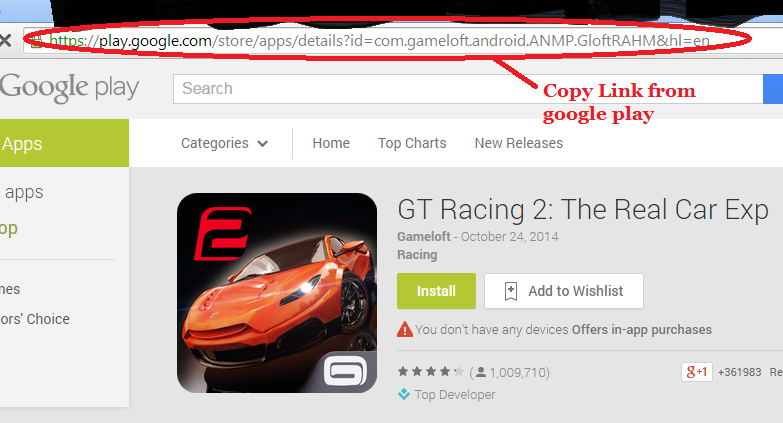 Simply Copy(Fig.1) the particular app link that you want to download and then visit this Link. 2. Then simply paste that Google play store app link in the dialogue as shown in (fig.2) and click on generate link and after 2-3 seconds a link will appear and then simply click on it and your download will start.